Here at Android Central, we love the whole idea of using voice commands to make our phones work for us. In the smartphone world, Vlingo is pretty well-known, with apps on multiple platforms, and we've been using it a while now. Now drift back to the spring when we first started hearing about the Genius button on the MyTouch 3G Slide, and how it offers similar functionality, and you just know we had to check it out and see how it compares. So hit the break, and watch as we pit Vlingo up against the Genius button and see which comes out on top. You've seen my test, now let's talk about what we saw. Both applications work, and in some areas are pretty equal in accuracy and result. In other areas, not so much. I've broken things down into 10 categories, and we'll score both applications in each. The Genius button struggled with this one. As I say in the video, it very well could be the bit 'o twang in my voice, so it's understandable. What's remarkable is that if my accent is the reason the Genius button couldn't tell I wanted to dial a number, Vlingo handled it just fine. Vlingo gets the point here, while the Genius button bowls a gutterball. Again, the Genius button wasn't quite up to snuff here. It did recognize I wanted to send a text message, and found the name in my address book, but doesn't pick up the message text like it's supposed to. Vlingo, on the other hand, was flawless. Point to Vlingo for working as advertised, and a half point to the Genius button, for being half right. Sorry about the blur. The test was filmed in one shot, and I'm sure you can understand the need to block out e-mail addresses. Once again, the Genius button misses the mark, but comes close. It correctly identified that I wanted to send an e-mail, and correctly entered both the subject and the body, but couldn't seem to tell the name Terry from the name Eric. Vlingo seems to be able to parse my accent and root through my contacts to find who I'm looking for, as well as fill the subject and body fields of the message correctly. Full point again to Vlingo, and another half point to the Genius button for the effort. Both applications were flawless in these categories. They work as advertised, are quick and the results were perfect. Each app gets a full point in all three categories. Easy to score. The Genius button doesn't, Vlingo does. And it did it perfect, the first time. Point to Vlingo, no score for the Genius button. Vlingo offers a choice of three sizes, as well as a widget for Safereader. Very nice. The Genius button is mapped to a hardware button, making a widget pretty unnecessary. Both apps get the full point for ease of access. It's one of those things that you have no idea just how great it is until you've had it, then lost it. Vlingo has it, and the video shows off just how handy it is (stroke of luck there, huh?). The Genius button doesn't offer this function, which is too bad. Voice commands and reader services seem to go together so well. Point to Vlingo, nothing to the Genius button. Vlingo isn't cheap. At 10.00 (USD) it's one of the more expensive apps in the Android Market. Is it worth it? To me it is, but as is often the case, your mileage may vary. Point to the Genius button, Vlingo gets blanked here. 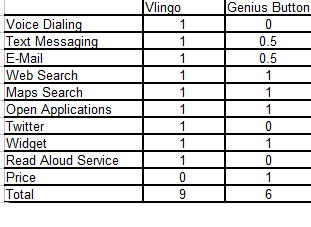 Results are above, Vlingo wins the showdown by outscoring the Genius button 9 to 6. 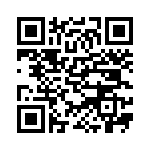 Vlingo is polished, and really sets the bar for an Android application. The Genius button, while not as feature rich and having a few issues, is system software and with the Geniuses (see what I did there) at HTC and T-Mobile working on it should only get better. Vlingo really impresses me with its voice accuracy. The filmed test wasn't a fluke -- during testing Vlingo interpreted what I was trying to say and who I wanted to say it to with amazing results. And huge points for handling the odd-ball accent of a Florida boy transplanted into the heart of Appalachia. 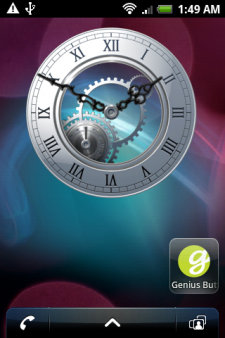 The Genius button has the benefit of being a native application and having a dedicated hardware button to activate it. It's light on resources, does quite a few things well, and is free. Those things can be just as important to some people as the rich feature set offered by the competition. Maybe the biggest issue is one of availability. I'm digging the MyTouch 3G slide while testing things out, but it's not a phone I use regularly. That puts the Genius button pretty much out of reach. Vlingo is there for the picking on most any Android phone (Android 2.0 and higher), and being in the Market is easy to get installed. Even if T-Mobile were to open up the Genius button as an app for it's Android customers, most of the world still won't have access to it. In the meantime, Vlingo is there to take up the slack. My criteria may differ from yours, but for 10 bucks I have to give the nod to Vlingo. It outscores the Genius button by a wide margin, and is a very high quality application -- something Android needs more of. My best suggestion? Hit the Android Market, and try it for 23 hours and make your own decision. You have nothing to lose, and I think you'll like it as much as I do.